Having recently read Susan Abulhawa’s novel Mornings in Jenin, I felt compelled to read a biographical account. Abulhawa created such an atmosphere in her story that it felt and read like a true account of a real family, rather than a fiction. At least it did so until I read Barghouti’s memoire. His book has been on my To Be Read list for ages, and not being much of a non-fiction reader it kept on being neglected. More the fool me! It is excellent. A lyrical, thought provoking account of homeland, exile, displacement, memory, loss and return. Barghouti was born in Palestine in 1944, and aged 22 was returning to University in Cairo when the Six Days War broke out. This denied him re-entry and any return for 30 years. he suffered a second deportation later, from Egypt, leaving his wife and 5 month old son. The man studied English Language and Literature and is a renowned poet and you can hear this in his narrator’s voice. His turn of phrase is exquisite, for example as he patiently waits to be finally allowed to cross home from Jordan, he describes the young soldier on guard at The Bridge across the River Jordan (The King Hussein Bridge/al-Karama Crossing/Allenby Bridge) , “His gun is my personal history. It is the history of my estrangement. His gun took from us the land of the poem and left us with the poem of the land. In his hands he holds our earth, and in our hands we hold a mirage”. On his eventually arrival in Ramallah, he see the settlements for the first time, how the road has been moved so you cannot see, and he cannot enter anyway, the city of Jerusalem, his mind is a riot of questions – was Palestine not green? what are these chalky dusty hillsides, striped of their olive trees? why did West Bank-ers call their fellow Palestinians displaced there from coastal cities refugees and immigrants? - brimming over with emotions of his own, of his family’s and of his nation’s caught in the triangle of time past, present and future, caught between the politics of governments and the politics of family. The reader really gets the turmoil of a man, displaced, a stranger in a strange land which is and should be his home land, a poet struggling for words, for his song. This book is packed with reflections, extracts from his poetry inspired by his memories of people, places and events, but what strikes you is that the places of his memories are in fact times, as he ponders just how much he really knows about the places and his homeland of now. I loved his poem “The Wink” which tells the story of a young village boy who received a wink from a girl as he dances at a wedding. I also loved the comical nature of some of his anecdotes – when he is living in Budapest they have taken a friend to the airport after a visit she has made en route back to Cairo. Then they find out that Pres Sadat has had many people arrested who had not supported him, the list includes their friend. Anxiously they try to get a message to her, but she is already in the air. Two days later there is news from Cairo. Yes she had been arrested as soon as she landed, but she and her cellmates were enjoying her duty free purchases! ashramblings verdict 5* One of the most beautifully written books I have ever read. 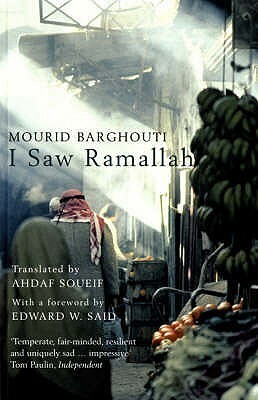 A compelling account of return after exile and all its associated feelings of displacement, loss, memory and remembrance..